95th day of the year. There were then 270 days left in 2019.
on the 14th week of 2019 (using ISO standard week number calculation). 17th day of Spring. There were 78 days left till Summer. April 5, 2019 was the 31st day of Lent (Christian Observance). New U.S. citizen Carlos Santana just defeated Canada. 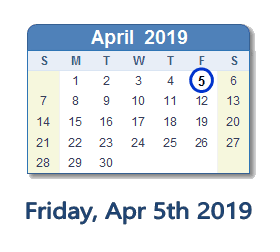 What happened on April 5th 2019?